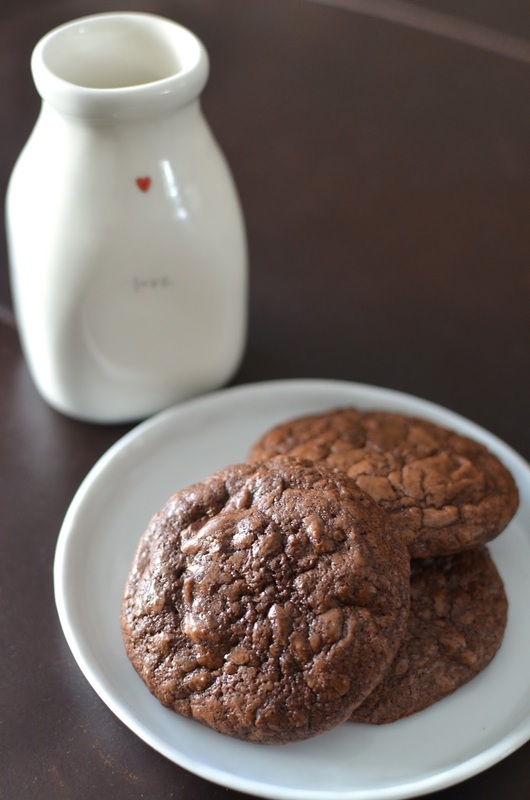 Chocolate is the prominent ingredient in these double chocolate cookies. Since there's not much flour in the recipe, the dough will be very soft, almost liquid, right after mixing and needs to chill (a few hours at least, or overnight) and firm up before baking. Once chilled, it still has the texture resembling chocolate truffles! From my experience, keep the dough cold and scoop it right before baking, or consider popping the baking sheets with the cookie dough into the fridge, or even freezer, for a bit before placing it into the hot oven. Try to scoop and shape the dough balls into tight mounds so it bakes up nice and round, as it tends to spread in the oven. I made smaller cookies than the recipe suggested - about 2 tablespoons of cookie dough per cookie (vs. 1/4 cup) - and divided the recipe in half. You'll end up with approximately 15 cookies if you do what I did. Bake the cookies until they're puffed and still soft in the center since you want them to be moist and they will continue to set up out of oven. You'll see the shiny, crackly tops that remind you of brownies. My favorite part is the center, with its intense chocolate flavor and occasional chunks of bittersweet chocolate here and there that feels like some sort of bonus. These cookies are for true chocolate lovers. The combination of bittersweet as well as unsweetened chocolate, melted and stirred in as chunks and in grated form, makes for a truly chocolate experience. These cookies are something like a cross between brownies and flourless chocolate cake. The recipe below is half the original and I baked them about half the size than intended but they still pack a big punch of chocolate in each bite. Place the 2 oz. of chopped unsweetened chocolate, the 2.5 oz. of chopped bittersweet chocolate, and butter into a heatproof bowl. Set on top of a pan of just simmering water and stir together until melted and smooth. Remove bowl from the heat and stir in the vanilla. Let mixture sit until thoroughly cooled, or place in the refrigerator for about 15 minutes or so (I found it tricky to set the mixture in the refrigerator without it setting into a truffle-like texture so I recommend letting it sit at room temp and stirring occasionally). Using the stand mixer fitted with the whisk attachment, whip the sugar and eggs together on medium-speed until pale yellow and thick, about 3-4 minutes. On low speed, add the cooled chocolate mixture and mix for just 15 seconds. The mixture will not be fully mixed at this point but you will continue to stir everything together by hand next. In a bowl, whisk together the flour, baking soda, cream of tartar, salt, and instant espresso/coffee powder. Stir in the finely shaved unsweetened chocolate and 2 oz. of bittersweet chocolate chunks. Add this to the dough and fold together with a rubber spatula until evenly combined. Transfer dough to an airtight container and let chill for at least 3-4 hours, preferably overnight, before baking. The dough can be stored in the refrigerator for up to a week. When ready to bake, preheat oven to 350 degrees. Line baking sheet with parchment paper or silicon baking mat. Drop about 2-tablespoon mounds of dough onto the baking sheet, spaced about 2-inches apart (I find it best to keep the dough mounds cold and shaped tightly, as it tends to spread right away in the oven). Bake until cookies puff, are cracked on top and still soft (though not liquidy) in the middle (they will continue to set up as they cool), about 13-15 minutes. Let cookies cool on a cooling rack for 10-15 minutes before transferring the cookies onto the rack to cool completely. The baked and cooled cookies can be stored in an airtight container, for up to 3 days. I am a true chocolate lover so I know these would be for me! Love your plate and ribbon - the presentation is wonderful. The cookies also look wonderful. Brownie and flourless chocolate cake - I don't think it can get any better! You can never go wrong with cookies and especially not double chocolate ones! I could just go one of these now. I agree...cookies, fresh cookies especially, never let you down. So chocolatey and rich...a heavenly treat for chocolate lovers. It is - thanks, Angie! Nothing can beat a chocolate cookie. And double chocolate = double YUM! Count me in! A perfect Valentine treat! I love all the attention chocolate gets this time of year. It's too short a time period! That shot of the dough!! Making me really want some of these cookies! I need to bake something for Valentine's day ... I feel like the holiday just crept up on me this year! I thought I might need to take the dough out to sit so it's not rock hard but it was so fudgy and I actually realized I needed to keep it chilled so it doesn't spread like crazy during baking. I agree about the time! I was telling my husband I can't believe it's almost Valentine's Day and we'll be talking about Spring in moments. Where did this winter go?! Time is truly flying. It'll be daylight savings again soon! Yikes! So little time to make and eat all these chocolaty treats. : ) Hope you had a great Chinese New Year celebration and have lots of nice treats to share with your family for V-day! I have quite a few cookbooks from bakeries/restaurants I like too. For me chocolate cookies need to be super gooey, so this sounds perfect for me! Ooh you can just tell how good these are. The top even has the same finish as a good brownie as you've mentioned! It's like the best of both worlds. I agree with every word you've mentioned about Valentine's day and chocolate! A mix between a brownie and a flourless chocolate cake can only be incredible! Just LOVE the way they look. Perfect in every way for V day. I love walking down the seasonal aisle at the supermarket or Target and looking at all the pinks and reds and chocolates for Valentine's Day. It's lovely. Thanks so much! I am a fellow chocoholic and I think these cookies will be chocolaty enough for your sweetheart! I love Joanne Chang's Flour recipe book, but have not tried this cookie...thank for sharing it...they sure look awesome, packed with chocolate...great treat for Valentine's day. Oh my god! The dough really looks like chocolate truffle! I may just eat a few scoops before baking. :P Rich and chocolatey brownie like cookies? Count me in! I have to try these! I know! : ) Lucky raw cookie dough has never appealed to me (and I better not start now!). Have a great Valentine's Day with your sweetie! So so glad to hear that your month is going great my dear. These cookies would be a nice special something for Valentines, hey why not celebrate with chocolate right?! I absolutely love double, triple chocolate cookies, these look like a great textured cookie. That dough looks so good, almost want to eat it up like that. Great tip on keeping the dough chilled and scoop it right out and bake. Love this one with all the crinkles on top. Enjoy the rest of your week my friend. There are so many ways to celebrate and I just grab any excuse to celebrate at all, Asha! : ) A few of my cookies that were not shaped tightly started spreading and didn't have that round shape I was looking for so hence, the little tip I learned. Hope you are enjoying the warm weather in your part of the U.S.! It's getting cold here! Anything with chocolate will always be a hit for me, not only on Valentine's day! Love the idea of using unsweetened chocolate, it sounds soooo good! I could eat that chiled out mixture, it looks so good!!!! Tis the season for chocolate everything! I'm not a huge lover of chocolate, but these are calling out my name! Ashley, we can still be friends even if you're not a huge lover of chocolate. In fact, it's a perfect combo because we could split the desserts. ; ) Happy Valentine's Day! I do agree with you that chocolate is common but February makes it something special. And that double chocolate cookies are amazing. It looks so soft and chocolate-y. Oh, and I love the heart-shaped plate. It gives out the Valentine feeling! I really meant that chocolate desserts are commonplace here (my baked goods are usually chocolate because I'm such a chocoholic!) but I think chocolate is nothing short of extraordinary! I have a feeling that you agree. : ) Have a great Valentine's Day and thanks for stopping by. Monica, just your description is sending me into a chocolate coma. I need to make these right away as they look so good and moist and delicious. Have a super weekend! I love that! A "chocolate coma" sounds like just the state of consciousness I want to be in on Valentine's Day. ; ) Have a great one, Bam. Yes, every bit of dessert always seems to be calling out for coffee. ; ) These cookies were wonderful and I wish I had some left right now. Have a great Valentine's Day weekend! We miss these cookies! ; ) It was a very nice V-day...I was most grateful that the little one wasn't sick anymore. Hope you had a lovely one. Looks so delicious. I can imagine tasting that gooey chocolate inside the cookies. Yuuum!